A British child was among 38 people who died when a pleasure boat collided with a ferry off Hong Kong. Cruiser Lamma IV, carrying partygoers to watch a fireworks display, sank shortly after Monday's crash, with many on board thrown into the water. Seven crew members from the two boats are being held on suspicion they did not "exercise the care required". The British Foreign Office confirmed there was a British victim but would not say if it was a child. 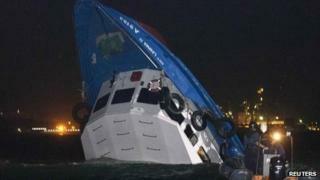 "We can confirm the death of a British national in the Hong Kong ferry sinking," a spokesman said. "Consular officials from the British Consulate General in Hong Kong are in contact with the family and are providing consular assistance." The accident off Lamma Island - the worst maritime accident for more than 40 years in Hong Kong - has caused shock in the territory, where thousands travel by boat between its islands every day. The Lamma IV had been carrying employees of Hong Kong Electric and their family members to watch the fireworks show held to celebrate China's National Day. While the pleasure boat sank within minutes of impact, the other boat - operated by the Hong Kong and Kowloon Ferry (HKKF) company - was able to reach Lamma and let passengers off. Twenty-eight bodies were recovered overnight, eight more people were declared dead at hospitals, and two more bodies were discovered on Tuesday, the government said. More than 100 people were injured. The number of people missing is unknown.